Although I love cooking and food, Thanksgiving has never really been a favorite holiday of mine. I’ve never enjoyed turkey, stuffing, sweet potatoes, or pumpkin pie, so the Thanksgiving feast usually turned into a sad little plate of mashed potatoes and cranberry jelly. The rest of my family wasn’t averse to experimenting with the traditions, though, and we’ve developed some very tasty twists on the tradition. One of my favorite recipes of all time, which fits perfectly into a Thanksgiving feast (or really any other meal) is spicy roast sweet potato wedges. wedges over; roast an additional 15-20 minutes, until golden and tender. Everyone needs their little bit on the side. Side dish, I mean. 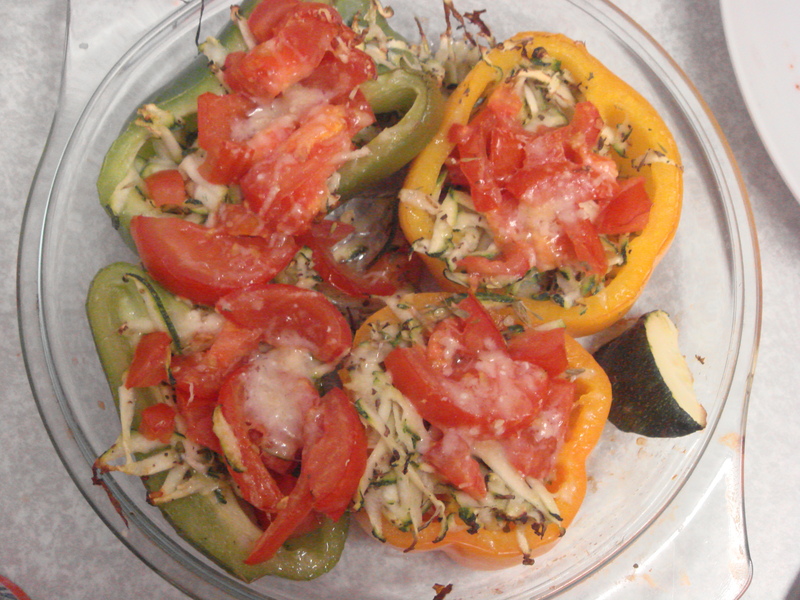 Stuffed capsicums are a sunny, summery side which are delicious and flavourful. What I really like about them, apart from their simplicity, is that they are robust and present beautifully. Their strong, though not overwhelming, flavour means they can stand up to whatever other mains you provide – I think they would be marvellous with plainly grilled meat or steak (mm…steak) – but they are also filling enough for any vegetarians you may be catering for (as a former vegetarian, I can attest that a little thoughtfulness in this area is much appreciated!). The recipe below reflects what I did. The recipe easily stretches and measurements are versatile. My capiscums were somewhat small and I had a little zuchinni left over; you could use more capiscum or different stuffings. I considered adding a topping of dried breadcrumbs and cheese to add a little crunch! Preheat oven to 180 degrees celsius and oil a baking sheet. Combine zuchinni and dried herbs. Stuff inside hollowed-out capsicum halves. Place diced tomatoes on top of zuchinni inside the capsicum halves. Place on oiled baking sheet. Bake until filling is cooked and capsicum are soft but not collapsed, about 20 – 30 minutes depending on the size of your beasts.